In line with the proposal of Serbian Ambassador Jasmina Mitrovic Maric, the first diplomatic library was established in Denmark at the University Library of Copenhagen. At a reception hosted by our Embassy in the University Library, organized on the occasion of the Serbian Statehood Day, the Ambassadors accredited to Denmark donated books in their own language, thus creating a collection of books in appreciation of various cultures and languages. The invitations sent out by the Serbian Embassy read: "Please do not bring along this invitation, bring a book instead, or even better, a book in your own language." 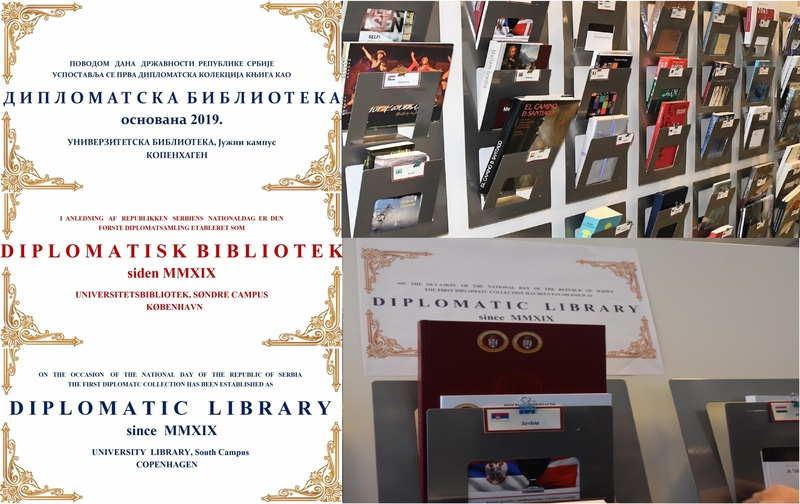 Ambassador of Serbia Jasmina Mitrovic Maric thanked her fellow Ambassadors who supported the newly-established diplomatic library which would be a reminder of Serbia's National Day this year and expressed gratitude for the gifts that would remain in the University Library in Copenhagen. A multi-media exhibition "Belgrade-Copenhagen, 102 years of diplomatic relations" was opened in the University Library on that occasion, mounted by the Archives of Serbia and Yugoslavia, Embassy of Denmark in Serbia and Serbian Embassy in Denmark, company Filmske novosti (Newsreels) and the Danish National Archive.